Congrats! 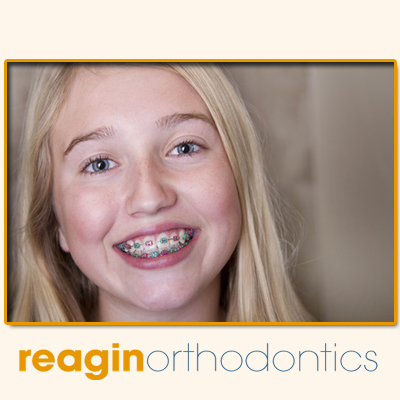 You have your braces and you are on your way to a great smile! At first your mouth may be a little sore and eating softer foods is advised. Once the tenderness is gone you can get back to eating most of your favorite foods. You just need to make a couple of adjustments. If you love crunchy foods such as apples and carrots, it is best to cut them into smaller pieces and avoid biting into them with your front teeth. Using your front teeth on hard foods can cause a wire or bracket to break. Sweets can still be enjoyed occasionally, but don’t overindulge because sugar from sweets and sodas can get trapped under the brackets and cause tooth decay. Sticky and chewy foods such as caramel and taffy are best avoided altogether because they can be very difficult to remove from your braces. Those are the only changes you need to make in your diet! That doesn’t sound too hard does it? Now what about brushing your teeth with braces? Brushing is very important and you will need to do this more often than you did before braces. Dr. Reagin recommends you brush after every meal and snack to avoid food particles and sugar from getting trapped in your braces and causing problems down the road. Carry a travel toothbrush with you in your book bag, gym bag or purse so you can brush your teeth at school or wherever you are after eating. If you cannot brush make sure to rinse your mouth thoroughly with water. At least once a day, preferably at night, you need to floss with special flossers called a floss threader. These allow you to get between your teeth and around the brackets and wires to ensure that there are no food particles remaining that you missed with brushing. Not brushing and flossing well can cause tooth decay, gum disease and even staining of the teeth under the braces. These things are easy to prevent with adding a couple of steps to your daily routine. It is well worth it in the long run!